Railfan Rail News features the latest news from the world of railroading and preservation in our print edition and on our web site. Did you record a newsworthy event? We depend on people like you to be our eyes and ears out in the world of railroading… Don’t wait, send us your newsworthy photos today! Examples of news items include delivery of new locomotives or paint schemes, special runs, restored vintage equipment, or incidents related to weather and operations. We are continually working roughly three months into the future, so don’t wait, send it now! Before you submit a news photo, please email your inquiry to Otto Vondrak. Attach a low-resolution version of your news photo, along with an explanation of what makes this event newsworthy. The editors will review and let you know if we want a high-resolution version for inclusion in the magazine. The last page of Railfan & Railroad is reserved for our “Parting Shot.” The subject of Parting Shot can be anything related to railroading: A humorous situation, a stunning scenic location, or a strong single subject. The photo must be vertical in order to be considered. To have your photo considered for Parting Shot, please send an inquiry to Steve Barry. Attach a low resolution version of your photo, along with caption information. If your image is selected, we will ask you for a high-resolution version (minimum 3000 pixels tall at 300 dpi). Railfan Photo Line is a monthly gallery of creative railroad photography featured on the Railfan & Railroad web site. We’re looking for a themed topic (and “theme” can be interpreted fairly broadly) based on anywhere from eight to ten photos. Each photo should be no smaller than 14 inches (or 1024 pixels) across at 72 dpi (no verticals, please). Brief caption information must accompany each photo. To have your idea considered for the online version of Photo Line, please send and inquiry to Otto Vondrak. Railfan Extra Board is a monthly exploration of the passion for trains from many perspectives featured on the Railfan & Railroad web site. We’re looking for about 1,500 words accompanied by two or three photos that illustrate your essay. Each photo should be no smaller than 14 inches (or 1024 pixels) across at 72 dpi (no verticals, please). Brief caption information must accompany each photo. To have your idea considered for Extra Board, please send and inquiry to Otto Vondrak. Railfan & Railroad is a monthly magazine targeted towards the active railroad enthusiast. We welcome articles on all aspects of railroading in North America, both contemporary and historic. We are always looking for articles on interesting short lines, tourist railroads, preservation projects and transit systems, as well as current operations on the Class I railroads. At this time we are not accepting works of fiction, poetry, or travelogues (travel articles). Not sure where to begin? Your submitted article should have a clear beginning, middle, and end. Some background information on your subject is always a welcome introduction. Never assume the reader is familiar with your subject, but resist the urge to over-explain. What makes your subject interesting to you? What will make it interesting to an outsider? Not sure if your topic is a good fit? Check out some of our recent issues to get a better idea of what Railfan & Railroad is all about. Please send an inquiry to Steve Barry before sending any feature material. A brief outline of your topic will help us understand your proposal better. Highlight what makes your topic unique and how it will stand out to our readers. Due to the volume of phone calls we receive each day, we prefer that you contact us via email. Railfan & Railroad is produced electronically, and as a result, we prefer to work with digital images for photography. All digital images should be at minimum 300dpi and 3000 pixels across (roughly equivalent to a 10×8 image); and saved as either high-quality JPG or TIFF file. We recognize that the vast majority of modern railroading has been recorded on 35mm slides and color transparencies. In order to eliminate the risk of losing valuable originals in the mail or other forms of damage, we prefer that you provide us with high-quality scans saved to a CD or DVD. We cannot use images made from home consumer scanners, nor can we work with duplicate slides. There are a number of professional photo labs around the country that can create high-quality scans of your work inexpensively. We can work with black-and-white prints provided that they are 8×10 or larger. We cannot accept negatives or color prints. All submitted images should be keyed to a list of caption information. Each submitted print must have the photographer’s name and address on the back. Railfan & Railroad pays for submissions featured in the print edition after publication. Payment will be processed upon publication of the printed edition. 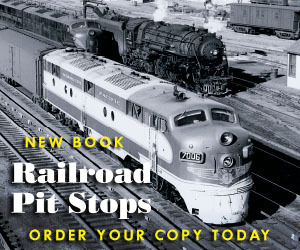 Submissions to the R&R web site at railfan.com are contributed gratis.